A blend of Dark roasted Fusion Coffee with distinctively rich and strong taste. Its well – balanced and tantalizing flavour will keep you coming back for more. Fit your body with energy and kick-start your day with this delicious coffee every day. Robust – Enrich – Aromatic – Long-lasting. This is the R.E.A.L coffee aroma that Caffebene strives to deliver, which can only be achieved by using real coffee beans and pouring real passion into every brew. Wrapped in a sachet of our instant coffee is the combination of all above, coupled with the right amount of milkiness and sweetness. It is a cultivated aroma that allows you th savor the smoothness of altte and the streghth of world- renowned specialty White Coffee in the same cup. That is what Caffe Bene’s “Real Bean, Real Coffee” philosophy really means. Today, in the midst of the hustle and bustle of daily life, it is now possible to savour a cuppa that gives you a taste so rich, so smooth, it is literally the pinnacle of enjoyment. All this in the comfort of your own home – a taste of premium fusion Coffee that’s only suppose to exist in café made available right in your cup, on your sofa, at your living room. 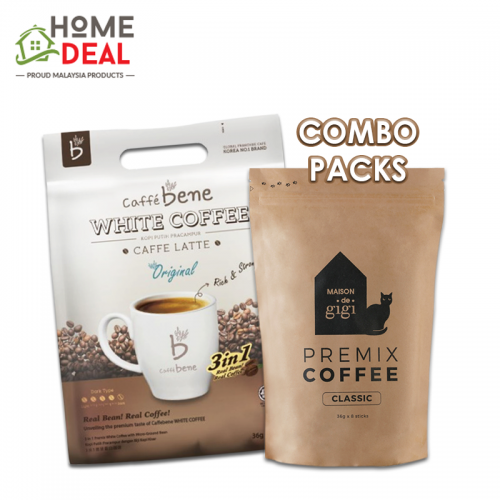 Bring home a pack of convenient instant mix of Caffe Bene today, or savour the premium aroma of Fusion Coffee at one of our lifestyle cafes nationwide.